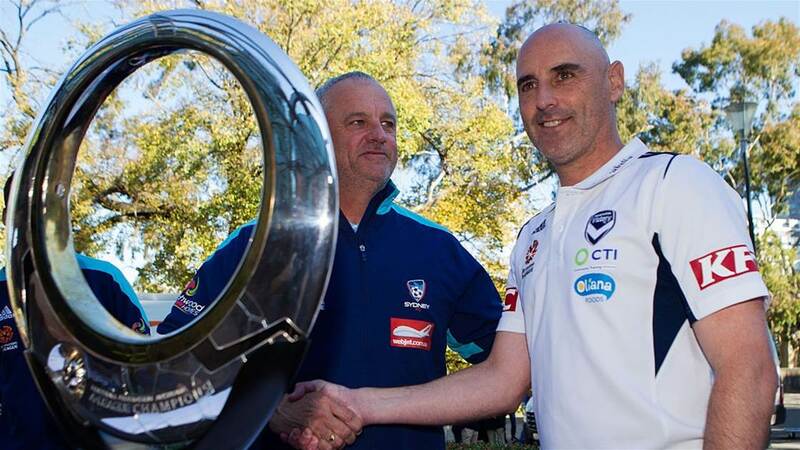 Graham Arnold has reportedly requested that the A-League doesn't present Sydney FC with the Premiership trophy until they've played Melbourne Victory in Round 27. Sydney FC stand to make history tonight against Perth Glory, becoming the first side to win back-to-back A-League Premierships. But there won't be much celebrating the historic feat, according to coach Graham Arnold, who wants Sydney to feel fully motivated to beat Melbourne Victory on April 13. Sydney have to win one more match this season to secure the trophy, with Newcastle Jets currently eight points behind them in second. As a result, Arnold's reportedly requested that the A-League wait until after the Victory match to present the Sky Blues with the Premiership, as Sydney want to end their season on a high by beating their bitter rivals in the Big Blue. In part, it could also be Arnold attempting to galvanise his side's confidence leading into the finals series, by ensuring they beat one of their main Championship-rivals. Victory currently sit fourth on the ladder, 20 points behind Sydney.